If you’re a huge Star Wars fan and need everything associated with the franchise, there are worse ways to spend ten bucks. 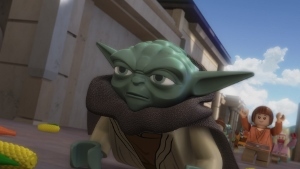 LEGO Star Wars: The Empire Strikes Out originally aired on Cartoon Network in September, 2012 as a half-hour animated special. Without commercials, it runs a grand total of 22 minutes. 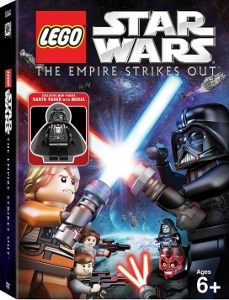 Unlike the previous LEGO Star Wars: The Padawan Menace, there are no bonus features on this DVD-only release. That makes Empire pretty skimpy, even considering the price (full retail, $14.98 isn’t that great of a deal). 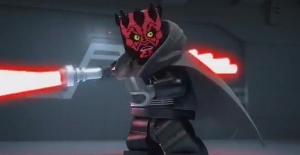 Part of what you’re paying for is the exclusive Darth Vader LEGO figurine. Again, depending on your level of completist collecting, that may or may not be a significant draw. 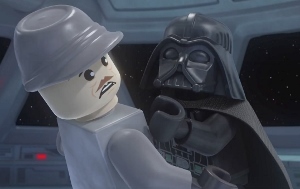 The Vader figure depicts the Sith Lord with a medal around his neck, something that ties in directly with the plot of The Empire Strikes Out. Speaking of which, the special itself is pretty fun. It’s loaded with gags, including a couple direct references to the much-maligned changes in the “special edition” Star Wars DVDs and Blu-rays. Even at 22 minutes, there are enough jokes that a second viewing will likely be required in order to catch them all. The story mixes classic characters (Luke, Han, Leia, Chewbacca, etc) with prequel characters (Jar Jar, Boss Nass, Darth Maul, Watto). Picking up after the destruction of the first Death Star, the Emperor unveils plans to construct a new one. He wants Darth Vader and Darth Maul at his side, cooperating, but that turns out to be wishful thinking. Meanwhile, Luke Skywalker is being chased by adoring teen groupies as he races to save the day. It’s all silly fun that kids will especially enjoy. John Armstrong voices Han Solo (not for the first time, he’s voiced him in several video games) and does a remarkably credible Harrison Ford impression. Older fans will appreciate the original film actors who have voiced their respective characters, including Anthony Daniels as C-3PO and Ahmed Best as Jar Jar Binks.